Radiohead and I go way back. First I heard of them was at the HMV in Square One, Mississauga back in… early 1993? In typical 17 year-old adolescent fashion, I was struck by the lyrics and how perfectly they encapsulated how I felt. The song was “Creep”… typical, eh? I bought Pablo Honey on cassette and pretty much wore it out over the next couple years. Come first year university, and Radiohead hadn’t been heard from in a while – they were seriously flirting with one-hit wonder status. Then came the curious move of releasing an EP domestically with My Iron Lung in the Fall of 1994, which I bought in the campus record store and which utterly blew me away. I’d always thought that Radiohead had potential beyond Pablo Honey, but I didn’t expect the six-song revelation that came next. I waited anxiously for The Bends‘ release in Winter 95 and with that record, I pretty much had a new favorite band. I went the whole nine yards – buying cassette bootlegs, getting friends to buy me t-shirts at concerts I couldn’t get to, amassing a collection of magazines with Thom Yorke’s squinting visage on the covers (now that is dedication!). In 1997, with the release of OK Computer, they were pretty much the biggest band on the planet but I still felt that connection of a long-time fan. It was a bond that seemed unbreakable. Then a funny thing happened on the way to the new millenium. To say that I didn’t like their new direction and wanted them to keep doing what they had always been doing is unfair – I am as big a proponent for artistic growth as anyone, even if it means a difficult transition for the listener. And Kid A was pretty difficult listening. It took a good long while, but after a while I figured I finally ‘got it’. I had penetrated their musical cipher and understood what their muse was saying. But the thing was, I didn’t want to listen to it anymore. I found myself playing Kid A more out of a sense of obligation than genuine desire. Weird. Amnesiac was more of the same, though I had less urge to make excuses for that record. To me, it sounded like what it was – a collection of cast-offs and tracks that didn’t fit on Kid A. While its predecessor had a definite unified ‘album’ feel, I found Amnesiac disjointed and lacking cohesion. There were some great tracks, but as an album, I thought it was lacking – and I still do. So my favorite band had put out a couple albums that didn’t leave me scratching my head, but did leave me looking around for something else to give me that same buzz they used to. My eye (or ear) was wandering. While Yorke & co were concentrating on creating even more claustrophobic and emotionally disconnected post-millenial anthems, I was getting into the rich melodicism and open-heartedness of classically-styled pop and country music. About as far from Radiohead as you could get at that point. But still, I left a porch light on, expecting that they’d end their wanderings in the desert eventually and come home to me. And when initial reports from the recording sessions on what would become Hail To The Thief, I thought that’s what they’d done. “They’ve gone back to their guitars”, some said. “It’s more accessible and rock-er than the last few albums”, others said. “They’re jamming on ‘Cinnamon Girl’ in rehearsals!” (this one was true – I have an mp3 of it). And they were right. They had gone back to their guitars. The songs were more accessible and more rock. Was this not what I’d been waiting for? So why did it still leave me feeling flat? After the initial heavy rotation period every new CD gets with me, I again found myself playing Hail To The Thief out of obligation, not desire. Hoping that this next spin would be the moment that it all clicked and got my juices going again. But the fact was, I had so much other music that I genuinely wanted to hear more. That did connect with me, that did resonate with me in a way that Radiohead didn’t, and maybe never did. Which brings us to tonight. Happy hour at the last-chance saloon. I’d heard more than a few say, “the material from the last few albums all makes sense when you hear it live”, and I hadn’t seen them live since touring OK Computer. So when the HTTT tour rolled through Toronto, I figured this would be a good make-or-break event. The blackout in August postponed decision day a few months, but the moment finally came tonight, and I was 12th row centre-left for it all. Actually getting to that point was something of an adventure that involved standing outside the box office at Skydome in the bitterly cold wind for upwards of two and a half hours waiting for someone – anyone – to tell us where the hell our tickets were. It was nightmarish at the time, but already seems like ancient history. Long story short – we got our tickets and some fans are waaaaay too zealous for their own good. I was thankful to not have floor admission, I was much more interested in being able to sit for the show. Yes, I am an old man. Kid Koala opened things off, and put on a pretty interesting set of turntablism. It’s not really my thing, but he was certainly good at what he did and was entertaining. Props to the marsupial. Radiohead took the stage precisely at 8:30 and played for precisely two hours. And I’m sure there’ll be scads of reviews in the local media for the next few days, so I’ll skip out on details, but will post some links as they come. – this post is already way long enough. There’s lots I could go on about, like my first time in the Skydome Concert Hall, or the remakable number of good-looking girls in the audience, but that’s neither here nor there, really. To sum up, they were very very good but my opinion hasn’t changed at all. There simply wasn’t the emotional connection there. I was blown away by their musicianship and the live spectacle of their show, but nothing touched me. But I’ve been to shows where that connection has occurred, listened to albums that have affected me on that level. That’s where the bar has been set, and that’s what I’m looking for from music. And so I conclude that Radiohead and I simply exist on different wavelengths now. We’ve grown apart. It’s not them, it’s me. Yes, you’re hearing correctly. I am breaking up with Radiohead. It was a great run and you’ll always have a special place in my heart, but Thom, Ed, Jonny, Colin and Phil, I think it’s best that we acknowledge that our time has passed. Which isn’t to say that we can’t still visit. I’ll still stop in and see what you’re up to, we’ll stay in touch, but what we had? It’s over. Thanks for the memories. crank! but a completely valid opinion. y’all should know that despite the old man syndrome, he was tapping his foot quite often. I guess I fall into the camp that like HTT more now that I’ve heard most of it live. & I already loved Kid A/Amnesiac. merp, merp. it was a yummy experience, close to being worth all the hassle. and I had floors too and had to sell em off, but I guess I feel the same way you do, they no longer inspire me to go see them cause there is not much more they can do to impress me anymore, they don’t change, they pretty much either stay the same and I change my interest in music, and we still have the pot smoking morons who keep going to the big shows to be seen. I never could get into Pablo Honey. The Bends was a good album but has pretty much faded from my consciousness. OK Computer to me seemed like a great album, and the little offshoot 7-track ep was an equally awesome aside. It was, however, listening to Kid A that I became a Radiohead fan. It’s one of few perfect albums where I can listen to it over and over and completely sink into it. Amnesiac was hella disjointed I agree. The Live album was terrible. Hail To The Thief is interesting, and basically I like where they’re going, particularly the country/electroclash mixture. It’ll be great once they figure that out. Overall though, HTTT isn’t really an exciting album. I realize the difference between me and most people, though. I don’t listen to lyrics, for the most part. I listen to how the sound, the music and the voice go together. To me the voice acts as an instrument, not a carrier of a message. I’m a much different kind of music fan. I guess that’s why I like electronica so much, because I don’t use words to find meaning in the music. 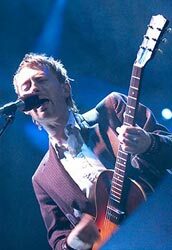 In this respect, I think Radiohead, since OK Computer, have been the best at incorporating the vocals-as-instrument theory that I’ve conjured up. But you’re point is completely valid, and I’m sure you’re not the only pre-KidA Radiohead fan to feel that way. Also, I think the big venue shows always wind up feeling cold. It really has a tendency, despite being amidst thousands, to isolate you as you watch the flecks upon stage, oblivious to your existance, perform to those closest to them. i’ve had similar thoughts myself. i never really got into pablo honey, it was the bends that got me into radiohead. much has obviously been written/discussed about that album, but for me it had the perfect mixture of the emotion and frustration that makes a truly memorable album. while i love what they’re doing these days, i don’t necessarily find myself needing to listen to it all that much. i want them to succeed, out of respect and because i think they’ve chosen their true course, it’s just unfortunate (for me)that i don’t find myself listening to them as much as i used to. i have a few boots from their current tour, and i just don’t hear the human connection that makes a band vital and necessary. they’re performances seem more esoteric in a way, and disconnected from their audience. jane stevenson is such a hack. she goes to the hugest shows and gives them all either 4/5 or 5/5. christ.